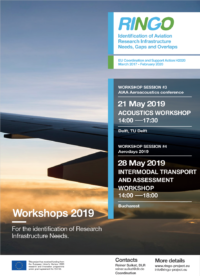 RINGO project recently held three workshops to assess the needs of aviation research infrastructures towards the goals of Flightpath2050. The workshops were successful, contributing to identify existing and future gaps and overlaps, useful for the further course of RINGO. Held in the framework of the 8th EASN-CEAS International Workshop on “Manufacturing for Growth & Innovation”, the three focused workshops explored the themes “Production and Mechanics”, “Aerodynamics” and “Aeroelastics”. 19 experts in the research fields addressed attended. Coming from 5 countries and different backgrounds (industry, universities and research institutes), they provided a variety of points of view, both with their comments about the research topics and infrastructure needs already collected by RINGO and in the identification of further topics and needs.